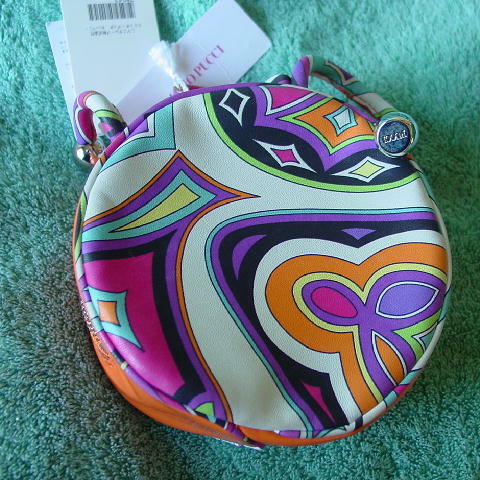 This never-used cylindrical shaped purse is an Emilio Pucci and was made in Italy. 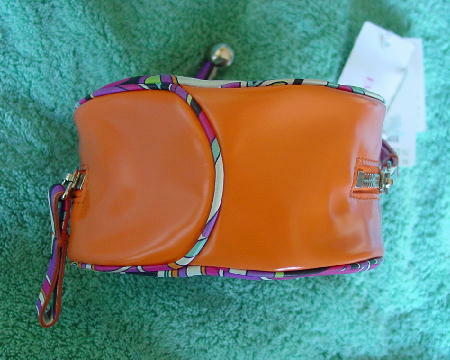 The side is in orange patent leather. 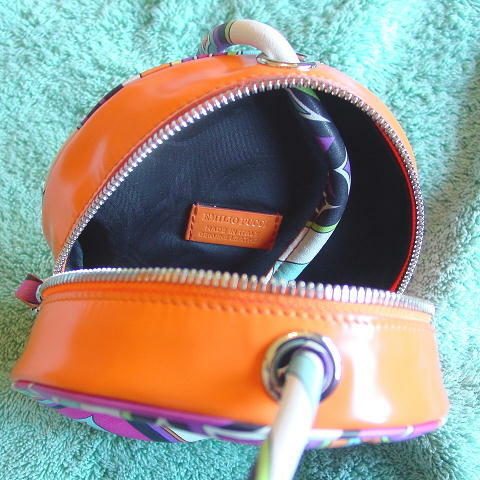 The front, back, trim, handle straps, and two 2 3/4" by 3/8" zipper pulls are lambskin. It has a top side to side zipper and a black 100% polyester lining with a tone-on-tone curved line design. At the end of the straps is a silver-tone metal ornament with Pucci etched on each bottom. 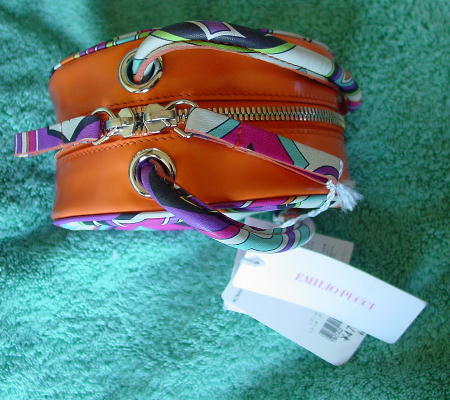 On the lining is a small leather tag that says Emilio Pucci Made in Italy Genuine Leather. The handle straps are 7 3/4" long (by 3/8" wide), including metal end ornaments. 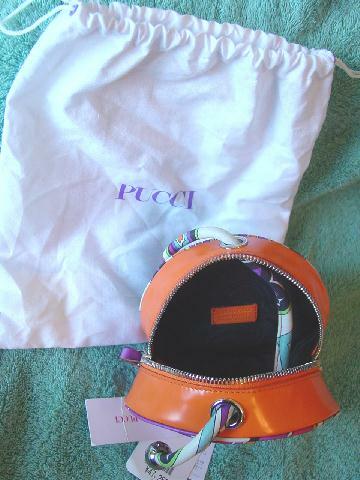 It has its own 10 5/8" high by 9 3/8" wide white 100% cotton bag (made in Italy) with a white drawstring, purple eyelets, and Pucci in purple letters on the front. It has the manufacturer's tag still attached and the Japanese store price tag - yen 47,250 (approximately $390 US). 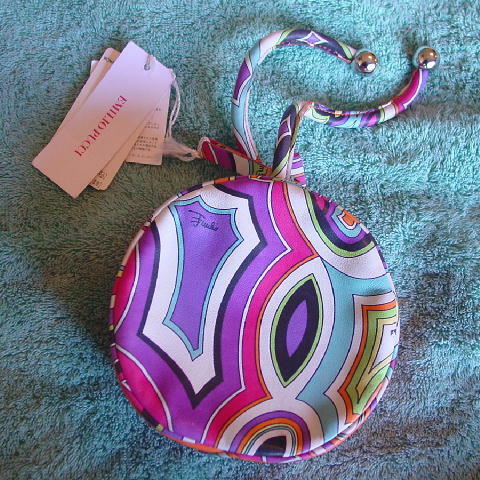 It has a signature print in orange, purple, white, green, aqua, yellow, black, and hot pink.